Cocina de Autor at the new Grand Velas Los Cabos, which opened on December 20th, has been named among the best new restaurants for 2017 by the international media giant CNN. Cocina de Autor at the new Grand Velas Los Cabos, which opened on December 20th, has been named among the best new restaurants for 2017 by the international media giant CNN. Two star Michelin Dutch Chef Sidney Schutte heads up the fine-dining restaurant working with Netherlands’ rising star Vincent Colauto as chef de cuisine. Chef Schutte’s Dutch heritage, passion for traveling and four years in Asia shaped his palate and inspire him to present different taste sensations in a single meal. Ingredients, too, themselves are a source of creative inspiration. Utilizing European techniques on the freshest Mexican ingredients, Shutte’s menu offers up eight courses with wine pairing nightly. Menu highlights for its opening season include Langoustine cooked in buttermilk and topped with endive, leeks, dill oil; Red Snapper served over mashed Tonka beans and topped with oyster, Iberian ham, lychee foam; and Goat cheese ice cream dressed with grilled pineapple, lime, hibiscus. The Cabo team joins the ranks of illustrious chefs Mikel Alonso and Bruno Oteiza who helm the restaurant in sister property Grand Velas Riviera Maya. Cocina de Autor is open for dinner from 6 p.m. to 11 p.m. daily. Reservations are required. Outdoor terrace and indoor, air-conditioned seating is available. The stylish, casually elegant décor was designed by Ernesto Vela. The tasting menu with wine pairing is available to all resort guests at no additional charge as part of the all-inclusive rate. For dinner reservations, call +52 1 624 1049 8264. Schutte gained extensive experience in prestigious kitchens throughout Europe and Asia, including those run by Dutch top chef Richard Ekkebus at Amber, a two Michelin star restaurant in Hong Kong; Roger Souvereyns, of the two Michelin-starred De Scholteshof in Belgium; and Jonnie Boer, acclaimed chef and owner of restaurant De Librije in Zwolle. With his support, De Librije earned its third coveted Michelin star. Only seven months after opening, Boer’s second outpost, Librije’s Zusje Amsterdam, was awarded with two Michelin stars under Schutte’s reign. He has been acknowledged as “SVH Meesterkok,” the highest recognition that a chef can achieve in The Netherlands. Chef Schutte’s Dutch heritage, passion for traveling and four years in Asia shaped his palate and inspires him to present different taste sensations in a single meal. Ingredients themselves are a source of creative inspiration. Colauto, who worked with Schutte at De Liberije, will oversee Cocina de Autor’s kitchen staff. He has completed training at the ROC and Spermalie in Bruges in addition to Katseveer, awarded one Michelin star. Velas Resorts’ Cocina de Autor signature restaurant was originally launched at Grand Velas Riviera Maya where it continues to be overseen by award winning culinary stars Alonso and Oteiza, disciples of Spanish uber chef Juan Arzak and owners of Biko in Mexico City, regularly among the top 50 restaurants in the world on the San Pellegrino list.This top talent earned Cocina de Autor at Grand Velas Riviera Maya the American Automobile Association's (AAA) Five Diamond award for restaurants in 2013, the first restaurant included in an all-inclusive to receive the nod. Since then, the restaurant has retained the distinction. 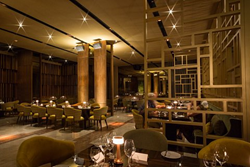 Upon its opening, the restaurant was named one of the "100 Best New Food & Drink Experiences" in the world by Food & Wine and among the top 50 restaurants in Mexico in Bancomer’s annual awards. Cocina De Autor first won the Five Diamond Award under Executive Chef Xavi Pérez Stone (now consulting chef), named “Best Chef in Mexico” in 2013 and winner of Canada’s “Iron Chef 2014.” The three chefs work with Nahum Velasco, who currently helms the kitchen, to determine the singular menu presented at Cocina de Autor. The new Grand Velas Los Cabos on Mexico’s Baja Peninsula is the fifth property of the Velas Resorts. Located between Cabo San Lucas and San Jose del Cabo, the $150 million beachfront property offers the next generation of all-inclusive amenities and facilities with dramatic ocean views and unique spaces infusing every area of the resort. All 304 ocean view suites are over 1,180 sq. ft. with private terraces and some personal plunge pools while duplex wellness suites have designated wellness amenities and insuite juice bars. Grand Velas Los Cabos features five gourmet restaurants with an extensive beverage program and wine based features inspired by the proximity to the region producing Mexico’s fine wines. A staff ratio of 3 to 1; 16,370 sq. ft. convention center with the capability for 20 breakout rooms; 35,000 sq. ft. Leading Spa with 16 treatment rooms and hydrotherapy facility; three pools; and pool and beach concierges are available. Rounding out the list of amenities and services are a Life Fitness Center with personal trainers, exercise programs, yoga, Pilates and meditation; recreational activities program; separate teens’ and kids’ club facilities and activities program; 24-hour personalized butler concierge service; and 24-hour insuite service. Opening in February, a gallery of contemporary art will continue the company’s commitment to bringing the art, fashion and culture of Mexico to guests. The curved, half-moon design of the hotel catches eyes along the corridor with an iconic grand entrance that’s open air, three stories high and over 300 ft. above sea level. All of this beachfront, just 35 minutes from the Los Cabos International Airport which directly services over 40 destinations in the United States, Canada and Latin America. Velas Resorts are operated by Eduardo Vela Ruiz, owner, founder and president of Velas Resorts, with brother Juan Vela by his side, vice president of Velas Resorts. For reservations or additional information, please call 1-888-407-4869 or visit http://loscabos.grandvelas.com.